With sadness we acknowledge the death of the Rt. Rev. A. Donald Davies, first Bishop of the Episcopal Diocese of Fort Worth. 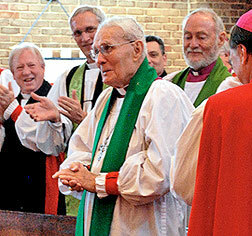 Bishop Davies died in the early hours of Sunday, Oct. 16, at the age of 91. A Requiem will be held at 11 a.m. on Friday, Oct. 21, at the Church of the Good Shepherd in Granbury, Texas. 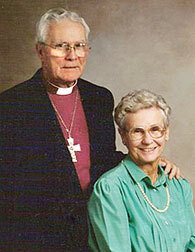 Bishop Davies was preceded in death by his wife of almost 70 years, the former Mabel Roberts, and a son, Allan David Davies. He is survived by four children: Dona Davies; Timothy Davies and his wife, Anita; Mark Davies; and Mary Townsend and her husband, Richard; as well as 10 grandchildren and seven great-grandchildren. Bishop Davies was a man of action, a faithful steward who built up whatever was entrusted to his care, and whose 50 years of active ministry took him to virtually every arena of church service. He was an early adopter of new technologies and set high standards. He was born in Pittsburgh, Penn., where his father, Archibald, designed blast furnaces for the steel industry. Donald met Mabel when they were in the 10th grade. She was an all-state swimmer and very nearly qualified for the 1940 Olympic team. The high-school sweethearts were married on Christmas Day in 1939. College seemed out of reach at the end of the Depression, but thanks to the encouragement of a friend, Donald graduated from the University of Tulsa in 1944. He attended Western Theological Seminary (now Seabury-Western), earning his Masters degree in 1947. While earning his Doctorate of Divinity, he joined the faculties of Huron College and the University of Tulsa, teaching Philosophy and Religion for three years. He was ordained to the diaconate by Bishop Goodrich Fenner in the Diocese of Kansas in 1950. Beginning as deacon-in-charge, he earned the title of rector within a year and went on to serve the diocese on the Executive Council, Standing Committee, and as chairman of the Department of Christian Education. He became rector of St. Paul’s in Manhattan, Kan., in 1952 and served three years as campus chaplain at Kansas State University. In 1954 Fr. Davies became a chaplain in the Army Reserve. He left the Diocese of Kansas to fill positions in the Adult Division of the Department of Christian Education at the Episcopal Church Center in New York from 1954 to 1958. Under his direction the Church’s Teaching Series and other publications were developed, and he began traveling abroad as a representative of the Episcopal Church in the U.S. In 1958 he was called to be rector of Grace Church in Monroe, La. In 1961 he became a Fellow of the College of Preachers at Washington Cathedral. Leaving Grace Church after four years, he served as a chaplain on active duty at Fort Hood, Texas, during the Cold War years of 1962-64. Fr. Davies returned to civilian life as a professor and sub-dean at Seabury-Western Seminary. In 1968 he was named dean of Trinity Cathedral in Omaha, where one of his predecessors was Alexander Garrett, later the first Bishop of Dallas. “Bishop Davies was fascinated with the life of Bishop Alexander Charles Garrett,” recalls Fr. Stanley Maneikis, who was a student at Seabury-Western during Dean Davies’ tenure. Bishop Garrett came to North Texas from New York in the 1860s and “wrote of Texas early pioneer days, the Texas frontier, and the cultural life of Texans at that time. In early 1970 the Diocese of Dallas was in the process of selecting a co-adjutor when the Bishop, the Rt. Rev. Avery Mason, died rather suddenly. At a convention in March, on the eighth ballot, Dean Davies was elected to succeed him. The new bishop was consecrated at the World Trade Center in Dallas on St. Alban’s Day, June 22, 1970, with some 3,500 clergy and lay people in attendance. At that time the diocese included the 24 Central Texas counties that became the Diocese of Fort Worth, as well as the area that makes up the Diocese of Dallas today. Bishop Davies at the consecration of his successor, the Rt. Rev. Clarence C. Pope Jr. (left). In his new role as diocesan, Bishop Davies inherited a deficit budget but soon put the diocese on a firm footing with a new assessment plan to fund diocesan ministry and create a reserve fund. Rather than continue to establish new missions, he strengthened the churches already in his care. He introduced computers for diocesan record-keeping and founded a credit union. Clergy compensation was brought more in line with the contemporary cost of living. The funds generated by a bequest to the diocese expanded the Bishop Mason Retreat and Conference Center and built the Bishop Davies Nursing Center in Hurst and Cathedral Gardens Apartments, a retirement facility adjacent to St. Matthew’s Cathedral in Dallas. Major renovation and construction was completed at Camp Crucis. Bishop Davies established and strengthened diocesan programs in education, urban ministry, and lay and pastoral ministry. He promoted Cursillo and other renewal ministries, and he nurtured a fledgling seminary program that became the Anglican School of Theology. In 1970, Fr. Rad Allen now recalls, Bishop Davies “inherited 5 or 6 men who had been ‘reading for Holy Orders’ under various priests, including one retired Air Force colonel. Bishop Davies formed the Diocesan Ordination Course. Classes met one week per month beginning Friday at 6:30 to 9 p.m. and continuing Saturday from 8 a.m. till 5 p.m. and Sunday from 8 a.m. to 3 pm. “The DOC started at St. Matthews Cathedral in about 1972. About 1975 it moved to the campus of the University of Dallas in Irving.” The Anglican School of Theology continued to train clergy for the Diocese of Dallas and, later, the Diocese of Fort Worth for the next 25 years. Bishop Davies helped fulfill one of Bishop Garrett’s dreams by supporting the Episcopal School of Dallas, and he reached out to the Hispanic community. The Hispanic congregation launched at St. Matthew’s Cathedral grew to number 500 souls. The diocese also formed a companion relationship with the Diocese of Central and South Mexico and sent a delegation to an episcopal consecration there in 1980. In the early 1980s he obtained funding from the Presiding Bishop, as well as local sources, to help resettle about 10,000 Southeast Asian immigrants in North Texas. For six years, from 1978-1983, Bishop Davies served as president of Province VII of ECUSA. He was a trustee of the University of the South, Seabury Western Seminary, and Southern Methodist University. Elected to ECUSA’s Executive Council, he chaired the Standing Commission on World Mission, a position he especially enjoyed, traveling to Asia, the South Pacific, and other parts of the Anglican world as ECUSA’s representative from 1980 to 1985. He played a key role in the implementation of the 1979 Book of Common Prayer, hosting at least one conference at Bishop Mason Center during the period of the book’s development and trial. A suffragan bishop, the Rt. Rev. Robert Terwilliger, was consecrated for Dallas in 1975, but the prospering congregations from Wichita Falls to Waco and Breckenridge to Texarkana kept Bishop Davies on the Interstate – as well as the farm-to-market roads criss-crossing North Texas – for much of the week. Bishop Davies called a Special Convention in November 1982 to form a western diocese, which chose the name Episcopal Diocese of Fort Worth. A corporation was formed for the stewardship of property in the new diocese. The arrangement, urged by Bishop Davies, represented modern legal and business methods, replacing the usual Episcopal Church arrangement, which put all property in the hands of the bishop. The new diocese sought membership in ECUSA and was admitted and open for business in the former rectory of St. Christopher’s Church in Fort Worth on Jan. 1, 1983. The church’s canons gave Bishop Davies the choice of continuing with either diocese, and he chose Fort Worth. 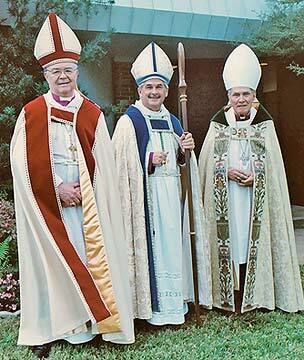 The 20th annual diocesan convention in 2002 brought all three bishops of the diocese together. Left to right are Bishop Clarence Pope, Bishop Jack Iker, and Bishop Donald Davies. Busy as he always was, he found time to relax with a bit of fishing or a round of golf. His main avocation from boyhood was woodworking, and the family garage usually held his tools and work benches, rather than automobiles. His children sought him there when they wanted to talk, and there often was a dog, too, keeping him company. Two examples of his craftmanship can be seen at the Diocesan Center: a glass-lidded display stand and a credenza. He often gave smaller wooden gifts to friends, colleagues, and family members. 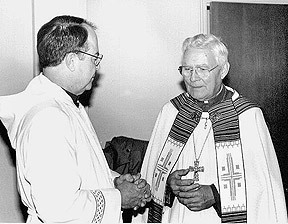 Bishop Davies retired on Jan. 1, 1985, after nearly 35 years of ordained ministry. He and Mabel continued to live in Granbury, where they already had made their home for several years. Their daughter Dona recalls the years in Granbury as among the happiest times of their lives. To mark the retirement, the Bishop was honored with a special service, which was held at St. Stephen’s Presbyterian Church in Fort Worth, since the diocese did not yet have a cathedral of its own. A reception was held at a Fort Worth hotel. It was an active retirement. Presiding Bishop John M. Allin named Bishop Davies to a three-year appointment as Bishop of the Convocation of American Churches in Europe, from 1986 to 1989. Headquartered in Paris, Bishop and Mrs. Davies enjoyed visiting the churches in his care in Florence, Frankfurt, Geneva, Munich, Nice, and Rome. His duties also included visits to congregations in the Church of England’s Diocese of Gibralter. Bishop Davies made frequent trips to the Vatican, where he formed a friendship with Pope John Paul II that was among the most gratifying of his career. Progressive trends in ECUSA’s General Convention prompted Bishop Davies to support the Episcopal Synod of America (ESA), a traditionalist movement founded in 1989 in Fort Worth. He served as its first Executive Director and later became the Bishop of a missionary diocese for ESA. For a period around 1990, the Davies lived in South Carolina, where the Synod hoped to develop a conference center. Further alarmed by ECUSA’s erosion in the 1990s, Bishop Davies founded a continuing Anglican church, which he called the Episcopal Missionary Church. This branched later into the Christian Episcopal Church of America and Canada, of which he was archbishop and primate. His actions prompted the ECUSA House of Bishops to give its consent “sadly” to his deposition in 1994. 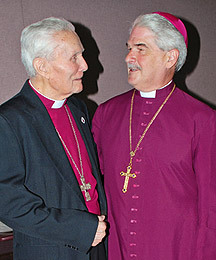 Bishop Davies’ lifetime of servant leadership was acknowledged during the College of Bishops gathering at the Inaugural Assembly of the Anglican Church in North America in June 2009. Around 2002, All Saints’ Hospital in Fort Worth was bought by the Baylor Health Care Foundation. The Bishop Davies Center, which had been given to All Saints’ years earlier, was set to be sold. Bishop Davies found three partners to buy the nursing center back. After that, his car, with its telltale University of Tulsa bumper sticker, could be found at his namesake center several times a week. He visited patients – including his beloved Mabel, signed checks, and peeked into every corner to be sure the center was providing the highest quality care. At Thanksgiving, he saw to it that every staff member received a turkey. In 2004, the center founded Bishop Hospice, a program licensed to provide end-of-life care in four counties. Bishop Davies will be remembered for his vision, his energy, his open and optimistic personality, and his constant devotion to his Saviour. “Bishop Davies always lightened up a room, wherever he was,” recalls Judy Mayo, who was a delegate to the 1982 Special Convention. “Whether at the podium at Diocesan Convention, or in the pulpit of a parish, or at a coffee hour or party, the twinkle in his eye could add spark to any address, sermon, or conversation. Bishops Davies and Iker in 2008. Bishop Davies was always a strong leader and a man of decision, as well as a man of deep faith. He knew how to make things happen, and he never hesitated to do things that he believed needed to be done. There will never be another like him. He was very independent and believed everything he said or wrote, in accordance with what the Church has always taught and believed. There never was a bishop who stood more firmly by his beliefs and always acted upon them. He did not care what anyone thought of him, particularly the inhabitants of 815 Second Avenue or the General Convention. It was my job as his coadjutor to amplify him and to act with one accord. This I honestly tried to do. May God bless +A. Donald and the Diocese of Fort Worth. Bishop Davies was committed to Camp Crucis. For nearly every session of summer camp, he would drive down from Dallas, spend an afternoon with the campers, and then drive back to Dallas. As an educator, he left his mark on seminary students, pressed for intergenerational learning, and utilized the latest classroom technology. In the 1960s at Seabury Western Theological Seminary, he obtained a reel-to-reel tape recorder for the students to record sermons. They were then played back to the amazement of the preacher, who actually could listen to what was preached. Nearly 40 years ago, he envisioned group homes for the elderly, to be built on the campus of a church. He had the opportunity to establish St. Stephen's Episcopal Church on the property of the Bishop Davies Nursing Center in Hurst, and a Seniors Apartment Building on the grounds of St. Matthew's Cathedral, Dallas. As a Bishop, he had an international vision – he traveled extensively to the Philippines, Europe, Africa, Asia, Central and South America. He had a missional view of how the Church should be. He was ecumenical, looking at the wholeness of Christianity, and lived the challenge of Jesus to "go into the world." He took great comfort in his relationship with John Paul II. Bishop Davies saw the darkening clouds of a gospel other than Jesus Christ, as the Way, the Truth and the Life. He could not live in a church that strayed from its ancient roots, and he did not. As a Welshman, he was firm about this. To look at Bishop Davies’ years as Bishop, one would see the growth of parish day schools, solid seminary curricula, well trained and disciplined clergy, and an adherence to the "faith once delivered to the saints." He admitted that his powers were limited. He often remarked that as the Bishop, only one priest ever took his advice. He was a rock of strength, with a forgiving heart. It can be said that Bishop Davies was most certainly like the New Testament formularies for what a Bishop should be. Bishop Davies was a remarkable, wonderful man, and a fine, strong leader and “shepherd of souls,” as well as being a genuine, caring pastor for his flock. I had the great privilege of working very closely with him on several committees of the Diocese of Dallas (which then included Fort Worth) during the 1970s and early 1980s, when – with his vision and leadership — Fort Worth became a separate diocese. Through the years, there were several things that struck me about this man of God who was a geunine friend to so many: his very real and geunine relationship with His Lord and Savior, his single-minded focus and vision, his love of educating people in the faith, his strong gifts in the area of leadership, his excellent organization, his true humility, his wonderful pastoral skills – but perhaps best of all, his quick wit and winsome way with people. Whether at the podium at Diocesan Convention, or in the pulpit of a parish, or at a coffee hour or party, the twinkle in his eye could add spark to any address, sermon, or conversation. He was at ease with all people, and in turn he made them – whoever they were – feel at ease. He lived in the very “real, practical world,” and his teaching always reflected that. I still have a copy of his book, Adventure in Renewal (Morehouse-Barlow Company, New York, 1974), in my library at home, which is a very practical help and guide to adult education in the parish. Bishop Davies is the reason I ended up in a Texas diocese as I went to seminary from the Diocese of Guatemala (too long a story for here), and I transferred to the then Diocese of Dallas because only Bishop Davies was willing to take a chance on this unknown kid in his second year of seminary at liberal Austin (not Nashotah!). Due to loyalty to him, I followed him when the Diocese of Fort Worth was created, the other two Dallas postulants stayed with the Diocese of Dallas. I was the next candidate through the process of formation for holy orders and the first to be ordained in the Diocese of Fort Worth as a deacon by Bishop Davies. (Lynn Bauman’s was the first priestly ordination, I believe.) I am deeply grateful to Bishop Davies for his trust, his mentorship, his guidance, and his willingness to step out in faith on many fronts, including taking a flier on an unknown (me). May his soul and the souls of the faithful departed rest in peace. I participated in the Diocesan Ordination Course (DOC). It took me five years to finish the courses, from September 1974 to June 1979. As DOC students, our Saturday nights were family nights. I recall that on one of those occasions divorce was discussed. Bishop Davies made it plain that he had a double standard for clergy: Clergy could not serve in the diocese if they divorced. He was quite adamant about that. I still have a letter from him commending me on the results of my General Ordination Examination, which was required before ordination. and was ordained priest one month before I graduated from the school. He ordained me to the Sacred Order of Priests on VI Easter, 20 May 1979. I was the celebrant for the corporate Mass at the DOC’s June meeting. He was a wise and gentle shepherd of his flock; I always appreciated his parochial visits. I mourn his death but celebrate his entrance into Paradise.